You are here: Home / News and Events / Catch up with Pratik Mistry, a GW Undergraduate Research Awardee! Catch up with Pratik Mistry, a GW Undergraduate Research Awardee! A senior majoring in biomedical engineering at GW, Pratik Mistry has recently been featured in GW Today! Becoming involved in research early in his college career, Pratik started working with GW's Nanofabrication and Imaging Center (GWNIC) since his sophomore year, and he has been working closely with Prof. Anastas Popratiloff. 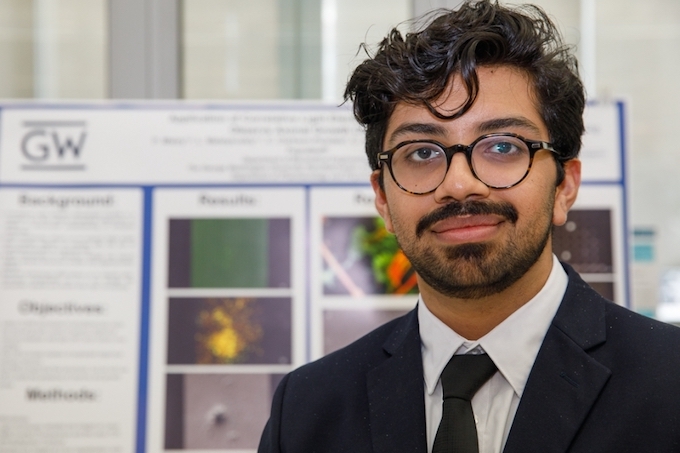 Pratik's use of two different microscopy techniques, light and electron microscopy, to observe the development of a neuron's axon is preparing him for his future career involving biomedical research.